A review of Commercial Alliance Health Insurance Company finds instead the Commercial Alliance Insurance Company. CAIC, as it is known, is based in Houston, Texas, and offers personal auto insurance coverage. Unfortunately, it does not offer health insurance policies. If you still need to find health insurance rates, look no further than this site. Simply enter your zip code in the box above and we will find the best quotes from insurance companies in your area. CAIC’s website does not offer as much information as other insurance companies. It appears that the company is still issuing insurance policies, even though the last press release was issued a little less than two years ago. Commercial Alliance Insurance Company began doing business in the U.S. in 1998 as a division of Comercial America Insurance Company, which in turn was an offshoot of Seguros Comercial América, S.A. De C.V., an insurance and financial services company in Mexico and Latin America. In 1999, CAIC began offering a “Non-Resident” auto policy for Mexican drivers who needed insurance coverage when they drove into the United States. Ten years later, in 2009, CAIC began offering non-standard auto insurance in Mississippi and South Carolina. In 2010, it expanded once more, this time into Alabama. Commercial Alliance Insurance Company plans to start offering auto insurance in California, Texas, and Georgia soon. CAIC touts the fact that its management team has been in place since the very beginning of the company, pointing to stability in a somewhat unstable industry. The company’s mission has remained the same since the beginning, as well, with an emphasis on values and customer service, and a goal to be the leading company in its target markets. CAIC specializes in automobile insurance, both standard and non-standard policies. It also began offering homeowners coverage two years ago. The company does not offer health insurance policies, and has not announced any plans to expand into the health insurance industry in the near future. Uninsured and underinsured coverage will pay your claims when you are injured or your car is damaged in an accident caused by a hit-and-run driver, or a driver who is not insured. If you submit a bodily injury claim and the amount is more than the other driver is covered for, the underinsured policy will pay the medical bills that are left after the other driver’s insurance pays to its limit. Liability will provide insurance protection if you are in an accident that is your fault, and there are injuries and/or property damage to the other vehicle, other driver, other passengers, or to your own passengers. It will also protect you if you are driving somebody else’s vehicle and get into an accident. CAIC’s non-standard auto insurance is for drivers that might have a harder time getting insurance coverage because they are considered high risk. This includes new drivers, as well as drivers with bad credit or poor driving records. This could also include drivers of high-value cars, such as collector, hot-rod, or high performance cars. CAIC has received a rating of “A-” or “Excellent” for its financial strength from insurance industry rating company, A.M. Best Company. A.M. Best has also given CAIC an issuer credit rating of “a-” and sees the company’s outlook as “stable.” The Commercial Alliance Insurance Company has received an “Excellent” rating from A.M. Best for eleven years straight. Currently, the company only has positions available in its Houston, Texas office. If you are interested, look at its website for an exact list of job openings, since they could change at any time. CAIC offers a generous employee benefits package. CAIC might be the company for you if you are looking for auto insurance. 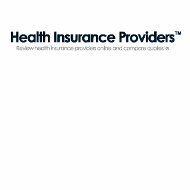 However, if you still need health insurance quotes, please type your zip code into the box below and we will find you rates from several providers in your area.